MLB.com's Jesse Sanchez blogs from the site of the 2007 XM Satellite Radio All-Star Futures Game. Players are starting to pull out their digital cameras and take photos that I’m sure they will hold dear forever. I hear some guys rumbling about food. It’s been a long day and although a protein shake might be filling (they have shakes provided for them in the clubhouse), it doe not sound very good to these guys at this point. They are hungry. Still excited, just hungry. It’s very sunny and very chilly here in the dugout. Nice weather … if you are prepared for it. Mets prospect Deolis Guerra is the next star for MLB.com. He has been mic’d all day and providing insight on and off the field. Check it out. The world behind the World team is made up of Sylvia Lind, Ana Cariello and Freddie Hernandez of MLB. Lind and Cariello have been integral parts of the Futures Game, especially the World team, since the game’s inception in 1999. Hernandez joined the duo this season. Their duties are countless (ranging from organizational to administrative duties to translating) and let’s just say the World team would not be able to function without them. If you are watching on television and you watch the World dugout close enough, you might see them ducking out of the way of a camera shot or two. Justin Upton just went deep for USA. 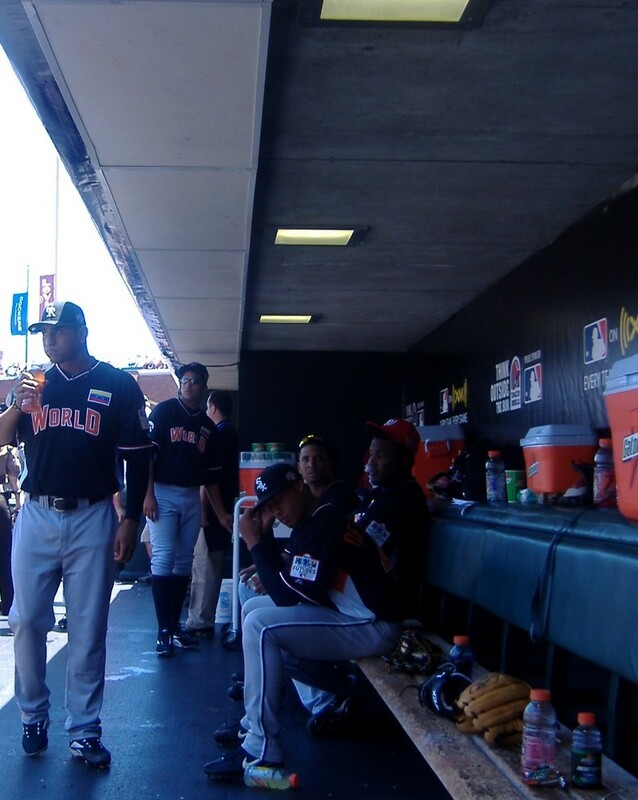 A lot of oohs and aahs from the World dugout …then silence. It’s 2-0 World heading into the bottom of the second inning. Juan Marichal just received a standing ovation in his own dugout and went out for a curtain call on the top step. His players are pretty much in awe of him. He is being interviewed by ESPN’s Erin Andrews as we speak. Let’s play ball!! The guys in the dugout are pretty excited. There is a lot of chatter going on — mostly in Spanish — and everybody seems pretty pumped up about the game. I don’t know who is going to win, but I know one thing is certain — this World team is going to have some fun. Lot of laughter going on right now. These guys are going to hate each other in a few years when both make it to the big leagues. The Rangers (German Duran) and The Angels (Freddy Sandoval) are in the same division, are rivals and can’t stand each other, right? Wrong. Most of the relationships developed between baseball players start at events like the Futures Game, in the Minors, or in the Winter Leagues. By the time the guys make the big leagues a lot of them are already good friends end up spending time eating dinner together after the games or with each other’s families. It’s a tight-knit group, especially among Latino ballplayers. Juan Marichal is the manager of the World team and trust me, that’s a big deal. The Hall of Famer is a living legend in Latin American and so revered in the Dominican Republic that he could probably run for president of the country and win — in a land slide. He met with Dominican media during batting practice and everybody talked about how he was going to manage the Dominican team in the 2009 World Baseball Classic. That came as a surprise to Marichal. He says he has never even thought about it, but he would definitely consider it an honor if he was asked. He said it took him about five seconds to accept the position as World team manager. Here’s a look from arguably the best pressbox in my favorite park in the National League. It’s hard to say I love this park more than I do The Ballpark in Arlington, but it’s close …very close. This park is a must-see for all baseball fans. It’s so scenic and there is definitely a cozy feeling going on here. It reminds me a lot Minute Maid Park in that way. The World is yours baseball fans. The World team anyway. I’ll be blogging away live from the World dugout in Sunday’s Futures Game in San Francisco, keeping everyone updated with tidbits, notes and photos from tomorrow’s stars today. If you have any questions about the game, its players or what the World means to you, hit me up with a comment and I’ll get back to you. See you at the park.